The very first leg of this extended jaunt around Scotland was four rounds in and around the Inverness area split between Castle Stuart, Brora, and Royal Dornoch. Much to the chagrin of the twitter “Itinerary Guy,” this meant that I had to skip Nairn and live with the fallout. You can’t play ’em all right? Well, enough Itinerary Guys weighed in to make me reconsider my route for week two, and it became clear that I couldn’t miss the chance to play this legendary gem. I made my way back up to the Highlands from Aberdeen for my 11:30 Friday morning tee time. No, this was not the ideal route, but with a rental car, and a once in a lifetime open schedule in front of me, what’s a few more extra hours in the car? It’s a dark, overcast day with a light drizzle, and the Moray Firth is angry this morning. The sound of the waves is deafening, and the walk to the first tee alongside the sea is one of the best I’ve seen. Nairn was founded in 1887, and they preserve their history better than almost any course I’ve seen (more on this at the bottom). A mix of names have been involved in its development over the years, the most famous name being Old Tom Morris. 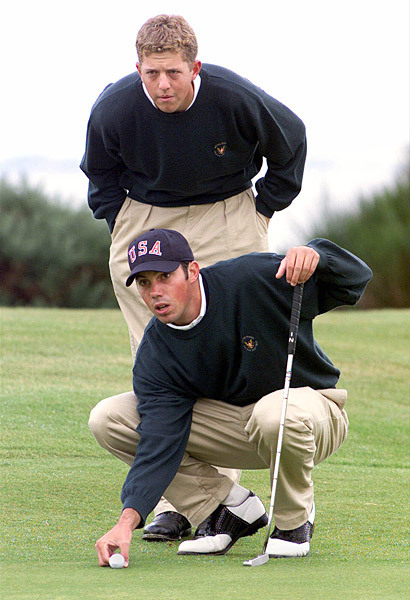 It’s most recent time in the spotlight was the 1999 Walker Cup (Kuch! ), where GB&I eviscerated the Yanks in singles in route to a 15-9 victory. Almost every course played on this trip is set right against the sea, but I continue to be astounded by the variety in styles of the courses. The first seven holes at Nairn play right along the water, and the land is very flat. This is not a knock at all. In fact, in my experience, the flatter the links course, the more interesting and intriguing the design elements are, particularly with the bunkering (with Royal Lytham and St. Annes and Royal Liverpool immediately coming to mind). From the onset, I’m in my yardage book trying to figure out which bunkers I want to take on, and which ones I want to lay back from on the very first tee. On the second, a 463 yard par-4, a ditch comes in at 285 that defines the hole. I try to lay off a driver, only to catch one flush and end up in the hazard for a foolish one shot penalty. I shook my head but smiled. That tee shot was a test, and though I executed the shot I was trying to with near perfection, and I failed the test. I was too greedy, and Nairn made me pay. Tip of the cap. True hazards in every sense of the word, and to me, the most defining characteristic on the golf course. Well positioned bunkers can make or break the design of a hole, and Nairn executes this to perfection. You continue out along the sea, move slightly inland on holes 8 and 9, then start your turn back towards the clubhouse. But before you do, you encounter the single most charming halfway house I’ve ever seen. A converted barn with rolling fairway terrain right up to the door. I wasn’t even hungry or thirsty, but I had to get something. I mean, look at this place! On the 10th green, I get invited to join up with a fivesome. To clarify, this is an already existing fivesome, and I’m now the 6th. Did I mention that Scotland is the best? Scotland is the best. The age of the members in this group varied greatly, and the banter was flying at a pace I could not keep up with. I don’t mind playing golf by myself, but it’s not even close to the experience of playing alongside someone you enjoy conversing with. But playing with a member takes it to an entirely different level. You inevitably get a history lesson as you play alongside the insight to the types of games they play, their drinks of choice, and of course the accents. On this misty day, I got the full experience. I get invited to join the guys in the clubhouse for lunch, where they tell me all about “The Archive Room.” The assistant pro, Sean Burgess, had messaged me prior to arriving to make sure I made time to see the room. I was starting to wonder what all of the fuss was about. I had absolutely no idea what I was in for, and I’m not exaggerating when I say that this room changed me. Like, it is going to be a requirement that I have a room in my house in the future that at least somewhat resembles this place. I know next to nothing about the history of Nairn Golf Club, and I could have spent a week in there going through the artifacts and reading the books. There’s 100 year old meeting minutes talking about the current weaknesses of the routing, the draining, the design, etc. There’s results from literally over a century’s worth of tournaments. There’s pictures, old golf clubs and balls, couches. It was perfectly manicured, and looked like something you would see in a museum. A bottle of scotch and some glasses sat on a nearby table, and books about links golf other golf courses littered the table surrounded by the seating. There were membership booklets from 1912. If you do make the visit to Nairn (and you most certainly should), it should be required that you request a key to the archive room.